Something I try to talk about on my social channels is charities close to my heart. If you read any of my charity blog posts at Christmas, you’ll know that chronic illness, domestic abuse, and mental health are subjects that are incredibly close to my heart. Where charities are concerned, I think the key is to support and use your voice to talk about things close to your heart. Whilst I can't save the world, at least I can put my passion into something close to me. Something I felt compelled to talk about today is domestic abuse. It’s a tough topic but something incredibly close to my heart and it’s worthy of all the conversations surrounding it. If you follow me on Twitter you’ll probably know I support Behind Closed Doors, an incredible local charity offering support to victims of domestic abuse. Recently, I was sat in a coffee shop and overheard a heartbreaking story of domestic abuse. I felt compelled to write this blog post in the hopes that it will help someone. Domestic abuse can happen to anyone, your Mum, you, your sister, your brother, your best friend, a collegue, your grandad. It's a universal issue, it's an issue I want to talk about even more in the future. Please do share if you think this will help someone. Sat in a coffee shop, I see a young man acting a little bit strange, he was evidently on edge about something and I couldn't figure out what. I was instantly drawn to him as I could sense how tense he felt. I was sat trying to mind my own business when he asked me to look after his bag whilst he made a call. I noticed he hadn't bought a drink and his coat was ripped all down the back, he was shouting on the pay phone down the road and instantly something didn't feel right. I was asking myself questions like, why is he using a payphone rather than a mobile? But I never imagined it would be what it was. A little bit later, what appeared to be a friend of his came and handed him a computer tablet, she told him to 'hide it somewhere when he needed to contact someone'. Suddenly it all unraveled, he was living in an abusive relationship. I don't want to go into too much detail as I recognise this is a private conversation but I feel that discussing this (as it's something that happens to so many people) could help someone or, save someone's life. That's how serious abuse is. His partner had been splitting his phone in two, changing his email address, deleting his social media profiles, ripping up his work and not letting him go out of the house for longer than an hour unaccounted for. I felt like crying hearing his conversation. We are so used to hearing of abusive relationships in relation to the woman being abused, whilst both are equally horrendous, I was just so shocked to hear his story. I wanted to grab him, hug him and tell him he's worth more than this. It's difficult for me to talk about this because I'm not yet in a strong enough position myself to share my experiences of domestic abuse, but growing up, I've been through them and I almost saw the people I love within him. He was weak and in love, he knew it was wrong but he said 'when my partner is good to me, it's perfect'. His friend was taking notes and I took comfort in the fact that he had reached out to someone. So many people go through abuse and either don't realise or, don't talk to anyone. According to the LWA, domestic abuse affects 1 in 4 women and 1 in 6 men in their lifetime. These statistics are shocking. I don't even really have the words to explain how upset I felt hearing his story of abuse. Now, whilst the above is a really serious and seemingly 'obvious' case of abuse to an outsider, every case of abuse is different and can vary. When in an abusive relationship, often, you don't even realize that you're in one, plus, often people in abusive relationships are good at defending the person abusing them and, hiding what's going on behind closed doors. I'd turn up to school smiling when I'd just been through turmoil that morning and inside I was crying. Not one of my friends or teachers knew what I was going through and weirdly, I thought this was how life was supposed to be for me. It's a vicious cycle and when you're in an abusive relationship, it's hard to get out. When you need the most strength, you're quite often at your lowest ebb because the abuser has a way of lowering your self esteem which makes you too weak to act. 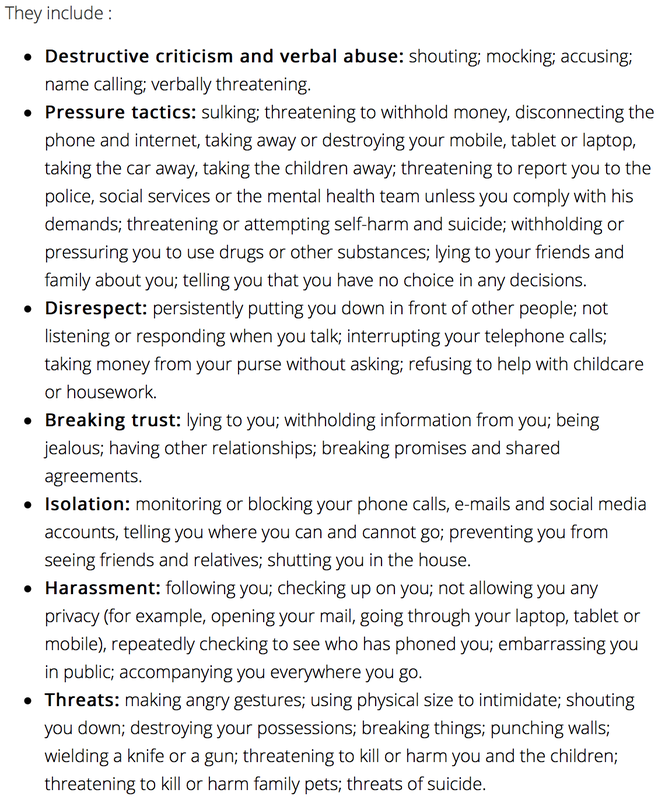 It can be impossible to spot the signs of domestic abuse when you’re in an abusive relationship, you feel as if it's normal to feel that way or to be treated like that. Often, you may only notice just how bad it was when you get out of the situation. 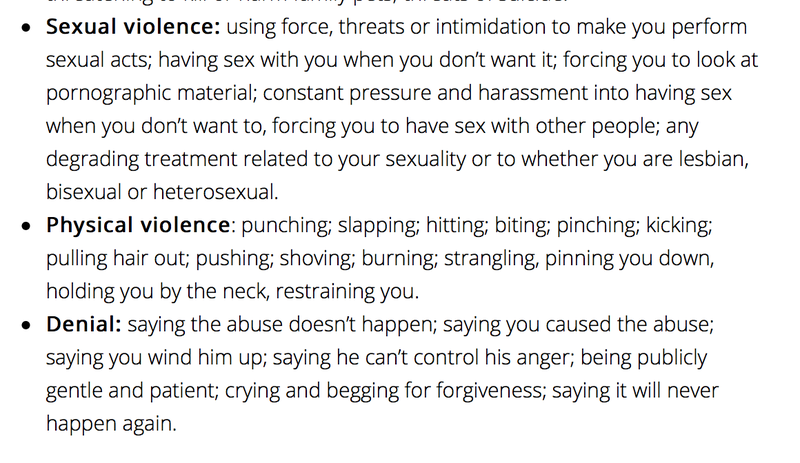 Domestic abuse isn't just romantic relationships, it could be a relative etc too. The story I heard that day made me feel sick with anger, such controlling behaviour, pushing someone down. This man looked quite 'shoddy' in his appearance (sorry, I cannot think of the right word) and I instantly noticed something wasn't right. I want to highlight the fact that people who are being abused, come in all different forms, it could be your neighbor who looks pristine, your teacher, your grandma etc. Just because someone looks okay on the outside, it doesn't mean they are okay. You really really do not know what goes on behind closed doors. Abusers can come in all shapes and sizes too, it doesn't mean they always break your phone up, it could be the controlling behaviour or nasty remarks and constant put downs. If you're a person who thinks you may be in an abusive relationship, if you find yourself regularly asking 'is it my fault' or blaming yourself, 'what have I done wrong' then please talk to someone. I wanted to use this post as a way to tell the person in that coffee shop and anyone else going through this: You are worthy, you are enough. You are not alone and you are certainly not a burden. I overheard the man tell his friend he felt like a burden, I promise you, you are not. You are someones reason to smile and there is always someone who will help you. There is a light at the end of the tunnel. Every day I feel lucky to be here, a survivor. Thank you so much for reading guys. One day I hope I can share my story. *I didn't know what photos to use on this post so please excuse me, but equally, I guess it's a reminder that just because someone is smiling on a photo, you don't know what has gone on in their life or is going on.